The Tale of the Dodgers' Red Uniform Numbers and the "Shot Heard 'Round the World"
The Los Angeles Dodgers' home uniforms are a harmonious visual symphony of vibrant royal blue and crisp, clean white, punctuated by bold red uniform numbers. A 1989 Sports Illustrated article quoted former Dodgers pitcher Tommy John as saying "You know what makes the Dodger uniform? It's the red uniform number on the shirt. I love that." 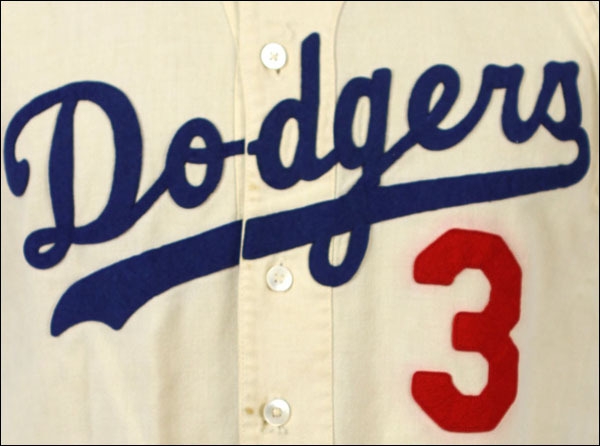 Although the Dodgers have utilized their familiar blue script lettering on their jerseys since 1938, the red numbers on the front of their home jerseys were added in 1952. Why red? Why 1952? What follows is a great story, one that involves one of the most dramatic moments in the history of the sport. The tale is rooted in the devastating aftermath of "the Shot Heard 'Round the World," Bobby Thomson's game-winning home run that propelled the rival New York Giants into the 1951 World Series. That homer—arguably the most famous in the history of baseball—punctuated a comeback for the ages as the Giants overcame a 12.5 game deficit to catch the Dodgers and eventually beat them in a three-game playoff series. The Brooklyn Dodgers added red uniform numbers to the set of jerseys that they had made up for the 1951 World Series. Thomson's "shot" rendered them useless until the following spring. "An Innovation of '52—Frustrated '51 Idea"
The brand new uniforms that the Dodgers unveiled on opening day carried five-inch identifying numerals on the left side of the shirt, below the team name, in addition to the regulation numbers on the back. This is another idea of Walter O'Malley, president of the club, and is of particular benefit to television fans who often obtain only a front view of a player before he passes out of the camera range. The stunt is one of good will to the public and while we would like to be able to report that this is an innovation from 1952, actually the story is the result of an unhappy ending. These uniforms were made for the Dodgers to wear in the 51 series! The '52 Dodgers were the first MLB club to employ what became known as "TV numbers"—a break from tradition—and another innovation for an already innovative franchise. The red numbers would presumably look good on black and white TVs, a major consideration for the club as they marketed to the new national mass media of television. This now time-honored uniform, well established for more than 60 years, was born of crushing defeat. One of the most indelible moments in the history of the sport delayed the debut of one of its most enduring visual traditions. Branch Rickey Created the Cardinals Uniforms, Then Nearly Scrapped the Dodgers Script Uniforms.